Not really a movie, but instead a rejected TV-pilot that got extended into a feature length movie, in order to still get a release. This failed reboot of the well known, from 1962 to 1969 running, "The Saint" TV-series, starring Roger Moore, lacks any real originality or any other elements that help to make it stand out from the average TV series/movie. There truly are more than just a few problems with this movie. First of all, its script is such an incredibly formulaic and predictable one that it's actually hard to see how they thought it would impress and be good enough for a pilot. Absolutely nothing in this movie comes as a real surprise, but what is worse is that it never becomes either anything fun or engaging to watch. It's hard to describe the style of this movie. On the one hand you could say that it's being more on the lighthearted side, but on the other it's also still trying to be a typical- and more serious thriller, with some dramatic elements thrown into the mix as well. Needless to say that it doesn't work out as anything very pleasant or appealing to watch. 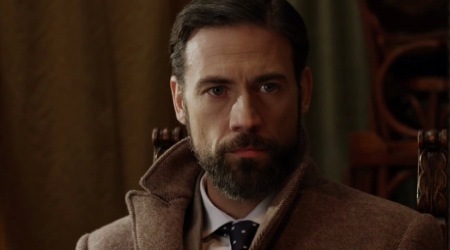 But maybe the biggest problem of this movie is its cast, or perhaps rather said; Adam Rayner as Simon Templar. He's just not a very good actor to begin with, but he is also neither charismatic or charming enough for his 'slick' role. He therefore is far from a likable enough main lead and he really doesn't know how to carry the movie and how to give his character an engaging enough personality. The secondary characters are better and more fun to watch, but also hardly anything that is unique enough. Like everything, the characters are all really by the numbers, from the 'good guys' to the villains of the movie and everything that is in between. And since it is original made for TV, there also really is a lack of some good action, despite the fact that action-director Simon West directed the movie. Nothing spectacular happens, while the movie really could have used some more fireworks, so to speak. Some fist fights, some gun fights, some helicopter action. You know the basic stuff, but where were the car chases, the spy gadgets. The main characters are all so called 'experts' in their fields, but absolutely nothing about them makes them appear that way. Simon Templar fires hundreds of bullets but never hits anyone and he actually gets caught and fooled more than you would expect from someone who's supposedly one of the best in his field, whatever that may be. No creativity or originality, no good action, not enough fun, a formulaic plot, a main character without the right required charisma. In other words, it really isn't hard to see why this never got picked up and turned into a TV-series. As a movie it obviously also remains far too formulaic and lacking in every department to consider this a good enough one to watch, even though it by no means is one of the most awful things ever made.